The intensity of frenzy being experienced in Yendi in the Northern Region as the outdooring of Yaa Naa Abubakari Mahama as king of Dagbon is underway emphasises how priceless peace is. Yendi has not known peace for the past 17 years due to a chieftaincy dispute between the Abudus and Andanis following the death of Yaa Naa Yakubu Andani II, which has claimed many lives over the period. Yaa Naa Abubakari Mahama was selected by Dagbon Kingmakers last Friday, January 18, 2019 following a difficult peace process by the Committee of Eminent Chiefs, led by Asantehene Otumfuo Osei Tutu II. President Nana Addo Dankwa Akufo-Addo who happens to be the special guest of honour for the long anticipated historic event arrived in Tamale on Thursday to witness the climax of the roller-coaster journey on Friday. As part the process, there would be a recital of the Holy Quran at the forecourt of the Gbewaa Palace in the morning before the event would be moved to the Jubilee Park at the Yendi SHS. Until his selection, Yo-Naa Abukari Mahama, about 70, was the Paramount Chief of the Savelugu Traditional Area. He succeeds his nephew, the late Yaa Naa Yakubu Andani II who died in March 2002. The successful performance of the final funeral rites of both Yaa Naa Mahamadu Abdulai and Yaa Naa Yakubu Andani in the Dagbon Chieftaincy divide in December 2018 and January 2019 respectively, paved the way for the selection of the new Yaa Naa. The processes formed part of the recommendations of the Committee of Eminent Chiefs as contained in the roadmap document submitted to President Akufo-Addo at the Jubilee House in Accra on November 21, 2018. The Committee of Eminent Chiefs was set up by former President John Agyekum Kufuor in 2002 to find a lasting solution to the protracted Dagbon chieftaincy dispute. 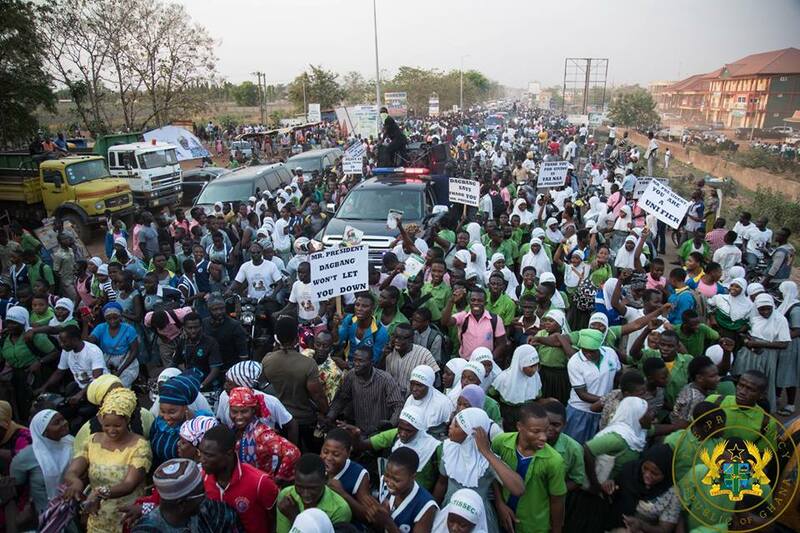 Myjoyonline.com reports that a journey that usually takes about 40 minutes, took the President’s convoy more than two and a half hours to get to the town from the airport as a result of the massive crowd and vehicles that had massed up on the road. It said some people lined-up the road to catch a glimpse of the President and to show their appreciation to him for his support to the cause of Dagbon. The elated president walked with confidence, raised a clenched fist and waved at the crowd to signify peace and unity. The President was received at the Airport by the Northern Regional Minister, Mr Salifu Sa-eed, members of the Northern Regional Security Council (REGSEC) and regional executives of the NPP. The historic event will take place at the Jubilee Park at the Yendi Senior High School, and will be chaired by the President of the National House of Chiefs and the Agbogbomefia of the Asogli State in the Volta Region, Togbe Afede XIV. The Committee of Eminent Chiefs that crafted the roadmap to peace in Dagbon will be present at the event. It is made up of its chairman, Asantehene Otumfuo Osei Tutu II and the paramount chiefs of Mamprugu and Gonja Traditional Areas in the Northern Region, the Nayiri, Naa Bohagu Abdulai Mahama Sheriga, and the Yagbonwura, Tuntumba Boresa II respectively. Representatives of various houses of chiefs, heads of institutions, chiefs and religious leaders, government functionaries, members of parliament and the public are all expected to converge on Yendi to witness the historic return of peace to the Northern part of the country. There is heavy security presence in the Yendi township and other entry points leading to ensure a peaceful event.